Takadanobaba may not be Paris, but it just got a little bit closer to the Latin Quarter with the opening of a charming new French restaurant called l'Amitie. Small but not cramped, this traditional, bistrot-style restaurant accomodates a total of 18 diners and offers a simple, bright decor of white curtains in the window and mirrors on one wall that reflect an array of facsimile antique French postcards and framed posters. Fans of George Brassens will be pleased to discover that he can always be heard singing at an unobtrusive volume in the background. Amitie offers excellent, cheerful service, and the restaurant is small enough that a nod will bring the waitress to your table. There is a reasonable prix fixe for lunch (1200 yen) and dinner (2000 yen) with over a dozen appetizers and main courses to choose from. All the food at L'Amitie arrives meticulously and attractively arranged on the plate in a way that will momentarily stop the conversation. 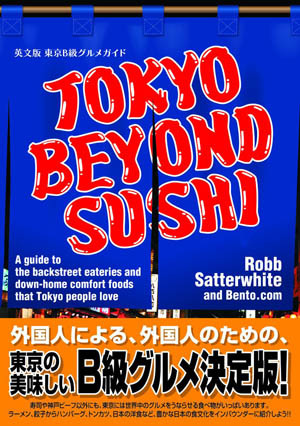 The cuisine is impeccably prepared and not overseasoned, although the food is decidedly rich. Among the appetizers, the Salade de Crevettes is a summer favorite, although, other dishes are more visually exciting. The Ratatoille tastes just like Maman's, but comes chilled with a poached egg carefully balanced on top. The Mousse de Fois de Volaille, accompanied by a salad, was both delicious and wittily presented with the mousse moulded to the shape and size of two fowl eggs. In the main courses, the Fricasse de Porc a la Baie de Cassis is remarkably tender and served with a well-balanced currant sauce, although the proportion of meat to fat (about 50-50) makes this dish inadvisable for dieters. The fish of the day, salmon, was gently sauteed and served atop a tasty, light cream sauce. Both were served with a delicious selection of fresh baby corn, broccoli and creamy mashed potatoes. If these dishes seem too dressed up, l'Amitie's menu also always offers Steak and frittes and a beer. L'Amitie is worth visiting for the desserts alone. All are made on the premises, and range from reliable standards like creme brule to a changing menu of refreshing, original fruit sorbets. The tarte au Abricots was not too sweet, thanks to the fromage blanc in its unusually firm, crisp crust. A decent wine list offers a selection wines by the glass, caraf or bottle, with bottles or red or white available from 2500 yen to about 5300 yen. Champagne is also on reserve in the refridgerated Cave European standing in the corner. Note: diners ordering wine by the glass are advised to ask for red wine that has not been chilled. 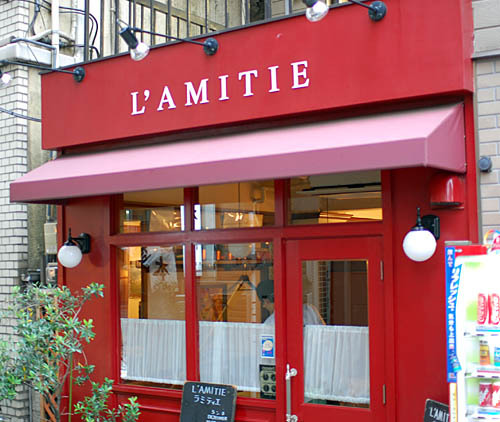 Perfect for a dignified yet unpretentious lunch or dinner date, l'Amitie offers the best traditional French cuisine in Takadanaba, displacing faded former title-holder La Dinette. L'Amitie is conveniently located just less than 5 minutes walk from JR or Tozai Takadanobaba stations.